The January 2013 issue of the journal Psychology of Sport and Exercise contains a meta-analysis of hot hand studies, conducted by Simcha Avugos, Jörn Köppen, Uwe Czienskowski, Markus Raab, and Michael Bar-Eli. 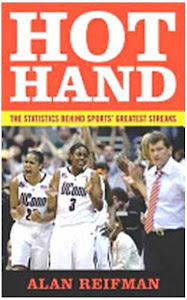 The authors located 22 articles providing tests of the hot hand (i.e., success begets success, and failure begets failure) in a variety of sports. Because some articles included multiple studies, there were 56 effect sizes in all. Results from each study were converted to a common correlational metric. The closer an effect size was to +1, the more supportive the study was of the hot hand (i.e., how an athlete performed on one trial is likely to be replicated on the next trial). Effect sizes close to -1, in contrast, convey the opposite of the hot hand (i.e., how an athlete performed on one trial is likely to be followed by an opposite result on the next trial). A zero effect-size doesn't support either trend. solid evidence for either the existence of a general hot hand effect, or for any moderating variable that can explain the extent of a hot hand effect" (p. 26). Just found this blog after reading David Brooks' article The Philosophy of Data. What I keep tripping up on is the meaning of "streak." I don't doubt that fans often project onto events in sports and commit a "gambler's fallacy" or what not. But A (as opposed to "the") notion of streakiness is simply that an athlete takes conscious control and practices to the point where the athlete sometimes hits "peak" or experiences "flow." That we can't predict whether an athlete is in this state at a particular time doesn't disprove that there is a non-random streak taking place. Maybe there is, maybe there isn't. But those who have participated in sports at a high level swear that there really is something non-random going on here. This sensually based, untutored belief would seem to need a stronger "knock-down" argument to dislodge it than simply that we can't tell that a streak is taking place by looking at large enough sets of numbers, or that the notion of streakiness has no predictive power. It could be that the thing that makes a streak a streak is private - when the varying parts of my body cohere this is a distinct feeling from when I feel discombobulated, and my shooting is effected, many times through hitting many shots in a row. Now, could outside observers see my behavior and make sound predictions? Not sure, but the feeling is so strong that I need more to abandon it than data that doesn't distinguish between random numbers and streaks, because they both have examples of apparent streaks. What causes the streaks in something like basketball? Well, to say that statistical studies show that streaks don't really exist seems the same to me as saying that a player can't get into a flow through conscious and repetitive practice, never mind predictability.